The new standard in home fitness! 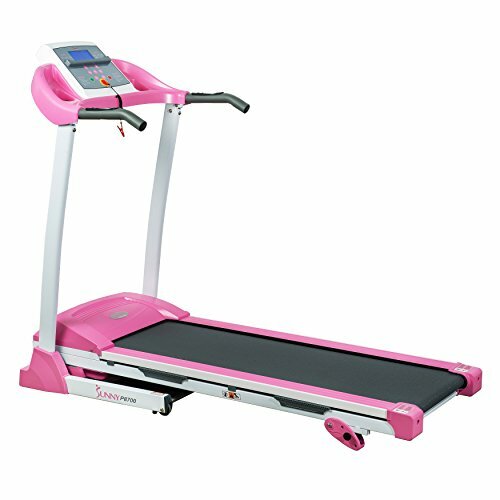 Sunny Health & Fitness P8700 Pink Treadmill offers all of the necessities for an amazing cardio workout that all at-home fitness enthusiasts could wish for. With a newly improved and quieter 2.20 Peak HP drive system, Min speed 0.5 MPH and a Max speed 9 MPH, 48.82” L x 15.75” W running surface, 3 manual incline levels, Large LCD displays Time, Speed, Distance, Calories Burn and Pulse, Soft drop hydraulic system, Handrail key controls and a Maximum user weight capacity of 220 Lbs, the P8700 Treadmill is designed for convenience while also providing the challenging feel of an outdoor walking, jogging or running. The quality of its heavy duty steel mainframe is built to withstand time and go the distance with users of all sizes and levels! Maximum user weight: 220 Lbs.